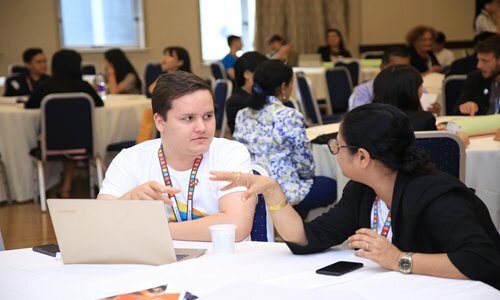 "Today, young people are more connected, more creative, more informed and more persuasive than any previous generations," said Xu Haoliang, assistant secretary-general of the United Nations and director of the Regional Bureau for Asia and the Pacific of UNDP. "Young people are responding to the challenges of the day with innovative approaches, contributing fresh ideas, creating the world they want and driving human development for themselves, their communities and their societies." The Asia-Pacific region is home to the largest group of youth at 717 million, yet many young people are still facing challenges; approximately 300 million youth are either unemployed or underemployed. In the region, UNDP is striving to help create and nurture an enabling ecosystem for youth entrepreneurs to fulfill their potential. Part of these efforts is the Regional Programme for Leadership, Innovation and Entrepreneurship (Youth Co:Lab), which aims to tackle social and employment issues by harnessing the youth's passion for social good. The program has reached out and trained over 1,700 young people and led to the launch and further development of over 140 social enterprises across a total of 11 countries. The Asia-Pacific Forum on Youth Leadership, Innovation and Entrepreneurship, which was co-organized by the China Youth Daily, China Youth Center for International Exchange and KAB National Promotion Office, brings together 300 national and international participants from more than 30 countries including government officials, UN representatives, incubators and enterprises, researchers and young entrepreneurs to take action on the SDGs and the 2030 Agenda. "The 2030 Agenda is not just the product of lengthy discussions among policy experts and diplomats sitting in meeting rooms in New York," Jayathma Wickramanayake, the UN Secretary-General's Envoy on Youth, said during her speech. "Young people played an important role in shaping this agenda. They are and will be the main torchbearers for its implementation," Wickramanayake said. 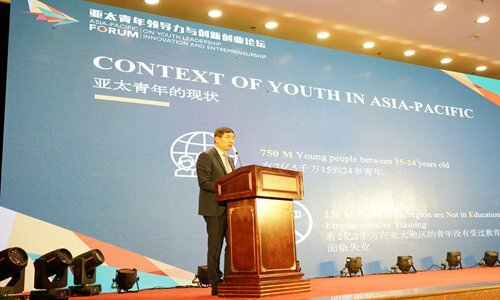 Dong Xia, deputy secretary-general of All-China Youth Federation said, "I hope young leaders today can explore together how to expand cooperation, deepen partnerships, support a new drive for development and create an enabling environment for sustainable development. I'm confident that all young people can lead us to a new era of peace and prosperity in the Asia-Pacific region."